Beer in Serbia (Serbian language: пиво / pivo) is not well known or famous outside of its national borders. Beer for home consumption is mostly sold in 0.5-litre bottles of deposit type (reused) and 0.33-litre glass bottles, as well as cans. Recently, most breweries began packing their product in plastic Q-pack bottles of 1.5, 2 or even 2.5 litres. In bars and restaurants, beer is either served in 0.33 or 0.5L bottles, or as "draught" (točeno). Serbia does not have legislation that limits liquor sales to specific licensed places. Hence beer (and any other liquor) can be purchased anywhere, including kiosks, supermarkets, grocery shops, gas stations and convenience shops, though sales to underage persons is prohibited. Pale lager dominates in Serbia, and dark lager, while being popular, is produced in smaller quantities. Some breweries produce kvass. Some European and American brands are distributed, while some are produced locally under license (mostly by its respective brand owners). Which brew is the best, and indeed which brews are good or bad is, of course, a disputed subject. 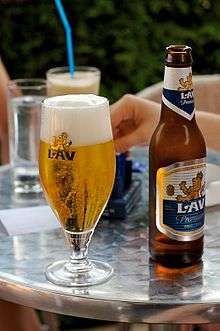 In a February 2004, in an online poll conducted by krstarica.com, the largest Serbian search engine, 5304 visitors voted on what is the "best domestic beer". The winner was Jelen, with 30% of the votes, followed by MB (26%), and Nikšićko (16%) (produced in present-day Montenegro), while all other brews received 7% or less votes. Started in 2003, Belgrade Beer Fest is held annually over 3–4 days at the foot of Belgrade's Kalemegdan fortress as a showcase event for various beer producers. In addition to domestic and foreign brews at affordable prices, the festival features live music performances each evening. It has quickly grown in size and popularity. On 31 December 2005 British daily The Independent named it as one of the worldwide events to visit in 2006. Dani Piva (Beer Days) is a beer festival in Zrenjanin, started in 1985, organised by the Zrenjanin brewery (Zrenjaninska industrija piva). ↑ "Belgrade Beer Fest - Vest". 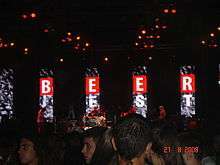 2006.belgradebeerfest.com. Retrieved 2013-03-07. ↑ "Blic Online | Popilo se 600.000 litara piva". Blic.rs. Retrieved 2013-03-07. ↑ "Carlsberg Srbija". Carlsbergsrbija.rs. Retrieved 2013-03-07. ↑ "Beogradska industrija piva" (in Serbian). BIP. Retrieved 2013-03-07. ↑ "Zatvara se Pančevačka pivara". Pancevo.co.rs. 2008-10-18. Retrieved 2013-03-07. ↑ "regionalni poslovni portal". SEEbiz.eu. Retrieved 2013-03-07. ↑ Where in the world will you be? The Independent, 31 Dec 2005. ↑ "Dani Piva". Danipiva.rs. 2012-09-23. Retrieved 2013-03-07. Wikimedia Commons has media related to Beers of Serbia.